Enquire or book a trip along Vĩnh Long - Sa Đéc - Cái Bè - Cao Lãnh. Boarding at noon at Vinh Long. Welcome drink, introduction to the ship and crew, check into the cabins. Departure from Vinh Long to Binh Hoa Phuoc district. Transfer onto a local boat for a visit of the gardens and orchards on the bank of the peninsula. Dinner is served as the Bassac gets under way towards the My Thuan bridge then drops anchor in view of the bridge for the night. Transfer for a visit of the town of Sa Dec, following the tracks of French novelist Marguerite Duras. Boarding back by noon. Welcome-back drink. In the afternoon, the longboat takes you to shore, for a visit of the plant nurseries, the Sa Đéc market hall and the house of _the Lover_. Boarding back by the end of the afternoon, and the Bassac gets under way heading downstream on the First River. The Bassac casts anchor for the night in view of teh large My Thuan bridge, and dinner is served on board. 07:00 Departure towards Cai Be. The passengers take their breakfast while enjoying the scenery on the banks. 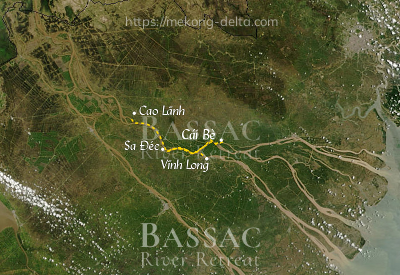 The Bassac soon leaves the main river to enter between the Cu Lao Tan Phong island and Tien Giang province. Checking out of the cabins and transfer onto a local boat for a visit of a Tram forest where Viet Cong Xeo Quyt base once was nestled, a moving token of the harshness of combat during the Vietnam war. End of services by mid-morning on shore at Cao Lãnh.